Is there a better alternative to Free Conferencing Now? Is Free Conferencing Now really the best app in Chat category? Will Free Conferencing Now work good on macOS 10.13.4? Free Conferencing Now widget instantly provides a permanent telephone number and passcode to have free, dial-in conference calls anytime. There is no account to set up and no reservations are required. This widget also has integrated tools for copying to clipboard or sending the phone number and passcode via email or iChat. 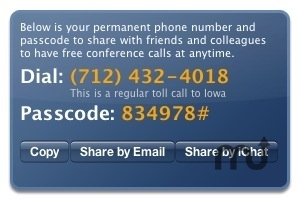 At the meeting time, all callers dial the phone number (located in Iowa, a regular toll call and effectively free on flat rate calling plans) and enter the passcode to join the meeting of up to fifty participants. Free Conferencing Now needs a rating. Be the first to rate this app and get the discussion started!